You’re playing a tournament, seated in dealer position, early on when the blinds are 15/30. You have two aces and there are three limpers into the pot. You raise and the three players call you. 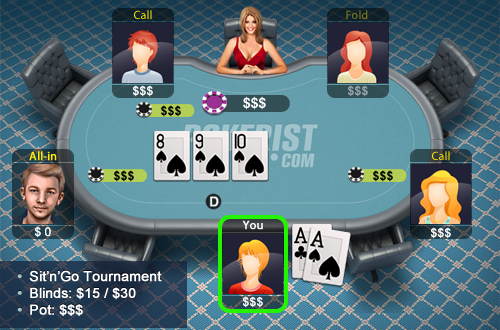 The flop comes out 8♠9♠10♠ - all spades and you don’t have a spade. The first player to act shoves all-in and the rest two players snap call.